In its broadest sense, "carnival" refers to a pageant, festival, or public celebration found all over the world. It originates in prehistoric times, varying in content, form, function, and significance from one culture to another. 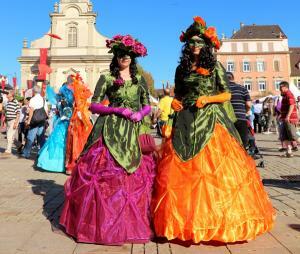 But in Europe and the Americas, "carnival" refers specifically to the period of feasting and revelry preceding Lent. The general consensus is that it began during the Middle Ages, evolving from the burlesque celebrations associated with Easter, Christmas, and other European festivities such as Maypole, Quadrille Ball, Entrudo, and Hallowmas. The word is said to derive from the Latin carnem levare, meaning abstention from meat or farewell to flesh, reflecting the self-denial such as fasting and penitence associated with Lent. Its synonyms are the French carementrant (approaching Lent), the German fastnacht (night of fasting) and the English Shrovetide (referring to the three days set aside for confession before Lent). Another school of thought links the word "carnival" to the Latin carrus navalis, a horse-drawn wagon for transporting revelers, arguing that its Christian aspects grew out of the seasonal Dionysian or Bacchanalian fertility rites of Greco-Roman times. These rites are noted for their emphasis on revelry, masquerading, satirical displays, and periods of symbolic inversion of the social order that provided an outlet for celebrants to let off steam. In any event, while most of the principles underlying carnival remain more or less intact, its form, content, context, and dress modes have changed drastically over the centuries. This is particularly the case in the Americas where carnival was introduced after the fifteenth century following European colonization. Since then, it has absorbed new elements from the aboriginal populations, Africans and other ethnic groups. 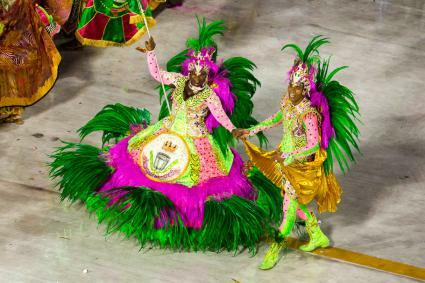 The emphasis here is on the carnival dress of the black diaspora in the Caribbean, United States, and Brazil where carnival is known by other names such as Rara in Haiti, Mardi Gras in New Orleans, and Carnaval in Cuba and Brazil. The African contribution to carnival in the Americas began when the European slave masters allowed their African captives to display their ancestral heritage in the visual and performing arts on special occasions for recreational and therapeutic purposes. These occasions include the Day of the Kings in Cuba, the Jonkonnu, 'Lection Day and Pinkster celebrations in the United States and the Caribbean as well as the Batuque (recreational drumming) in Brazil. The various attempts by enslaved blacks to revive African festival costumes in the Americas are well documented. Early eyewitness accounts describe slaves as donning horned masks and feathered headdresses, wearing shredded strips of cloth or painting their faces and bodies in assorted colors, just as they had done in their homeland. Some of these elements survive in the modern carnival, though in new forms and materials. Several sketches of carnival masquerades in nineteenth-century Jamaica by Isaac Belisario document African carryovers. One of them done during the Christmas celebrations in Kingston in 1836, depicts a mask with a palm leaf costume similar to that of the Sangbeto mask of the Yoruba and Fon of Nigeria and Republic of Benin respectively. A painting of the Day of the Kings celebration in Cuba executed in the 1870s by the Spanish-born artist Victor Patricio de Landaluze shows not only black figures playing African drums, but also dancers wearing raffia skirts and animal skins. Near the drummers is a masquerade with a conical headdress introduced to Cuba by Ekoi, Abakpa, and Ejagham slaves from the Nigerian-Cameroon border where the masquerade is associated with the Ekpe leader-ship society. 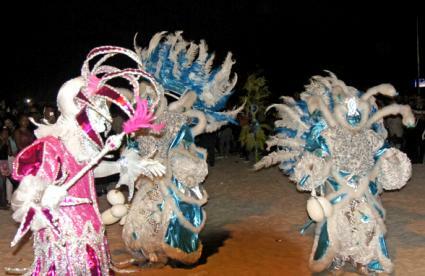 Now called Abakua, this masquerade is still a feature of the twenty-first-century carnival in Cuba. Another African retention in the modern carnival among blacks in the Americas and Europe is the Moco Jumbie, a masquerade on stilts. Apart from the fact that this masquerade type abounds all over Africa, it appears in the prehistoric rock art of the Sahara desert as early as the Round Head period, created about eight thousand years ago. At first, the public celebrations by free and enslaved blacks in the Americas during the slavery era occurred on the fringes of the white space. However, by the beginning of the twentieth century, emancipation had brought about various degrees of racial integration, allowing blacks, whites, Creoles, Amerindians, and new immigrants from Europe, Middle East, Asia, and the South Pacific to perform the carnival together. Each group has since contributed significantly to the repertoire of carnival dress, while at the same time borrowing elements from one another. For instance, even though the emphasis on feathers in some masquerades has African precedents, influences from Amerindian costumes are apparent as well, most especially in the black Indian Mardi Gras costumes of New Orleans. In the early 2000s a typical carnival is a public procession of musicians, lavishly attired dancers and colorful masquerades. Some are transported on decorated floats. The areas to be covered by the parade are usually closed to traffic. The costumes often combine assorted materials-fabrics, plastic beads, feathers, sequins, colorful ribbons, glass mirrors, horns, and shells-all aimed at creating a dazzling spectacle. In some areas, the parade lasts one, two, or three days; and in others, a whole week. There is usually a grand finale at a public square or sports stadium where all participants perform in turn before thousands of spectators. In Trinidad, Brazil, and other countries, a panel of judges selects and awards prizes to the most innovative groups and to the masquerades with the best costumes. As a result, carnival has turned into a tourist attraction-a big business, requiring elaborate preparations. In most cases, participants are expected to belong to established groups or specific clubs such as the Zulu of New Orleans, Hugga Bunch of St. Thomas (U.S. Virgin Islands), Ile Aye of Salvador (Brazil) and African Heritage of Notting Hill Gate (United Kingdom) whose members are expected to appear in identical costumes. Each group usually has a professional designer who is responsible not only for its costume themes, styles, colors, and forms, but also the group's dance movements. In Brazil, where African-derived festivals have been assimilated into the carnival, religious groups (Candomble) associated with the worship of Yoruba deities (orixa) may emphasize the sacred color of a particular deity in their carnival costumes. Thus, white honors Obatala (creation deity), blue, Yemaja (the Great Mother), red, Xango (thunder deity), and yellow, Oxun (fertility and beauty deity). Designers such as Fernando Pinto and Joaosinho Trinta of Brazil and Hilton Cox, Peter Minshall, Lionell Jagessar and Ken Morris-all of Trinidad-have become world-famous for their innovations. Some of Peter Minshall's costumes, for example, are monumental, modernistic puppetlike constructions whose articulated parts respond rhythmically to dance movements. Other costumes by him incorporate elements of traditional African art in an attempt to relate the black diaspora to its roots in Africa. This nationalism has led a number of black designers to seek inspiration from African costumes and headdresses, recalling the original contributions of African captives to carnival during the ancient Jonkonnu, Pinkster and Day of the Kings celebrations when they improvised with new materials. In the recent past, grasses, leaves, raffia, flowers, beads, furs, animal skins, feathers, and cotton materials were used for the costumes. These materials are increasingly being replaced by synthetic substitutes, partly to reduce cost and partly to facilitate mass production. Some costumes or masquerades depict animals, birds, insects, sea creatures, or characters from myths and folklore. Others represent kings, Indians, celebrities, African or European culture heroes, historical figures, clowns, and other characters. Cross-dressing and masquerades with grotesque features are rampant. So too is seductive dancing. The loud music-calypso in the Caribbean and samba in Brazil- adds to the frenzy, allowing performers and spectators alike to release pent up emotion. See also South America: History of Dress; Cross-Dressing; Masquerade and Masked Balls. Besson, Gerard A., ed. The Trinidad Festival. Port of Spain, Trinidad and Tobago: Paria, 1988. Cowley, John. Carnival, Canboulay and Calypso: Traditions in the Making. Cambridge, U.K.: Cambridge University Press, 1996. Golby, J. M., and A. W. Purdue. The Making of the Modern Christmas. Athens: University of Georgia Press, 1986. Harris, Max. Carnival and Other Christian Festivals: Folk Theology and Folk Performance. Austin: University of Texas Press, 2003. Hill, Errol. Trinidad Festival: Mandate for a National Theatre. Austin: University of Texas Press, 1972. Huet, Michel, and Claude Savary. The Dances of Africa. New York: Harry N. Abrams, 1996. Humphrey, Chris. The Politics of Carnival. Manchester, U.K.: Manchester University Press, 2001. Lawal, Babatunde. The Gèlèdé Spectacle: Art, Gender, and Social Harmony in an African Culture. Seattle: Washington University Press, 1996. Mason, Peter. Bacchanal! The Carnival Culture of Trinidad. Philadelphia: Temple University Press, 1998. Minshall, Peter. Callaloo an de Crab: A Story. Trinidad and Tobago: Peter Minshall, 1984. Nettleford, Rex M. Dance Jamaica: Cultural Definition and Artistic Discovery. New York: Grove Press, 1986. Nicholls, Robert W. Old-Time Masquerading in the U.S. Virgin Islands. St. Thomas, U.S. Virgin Islands: Virgin Islands Humanities Council, 1998. Nunely, John W., and Judith Bettelheim. Caribbean Festival Arts: Each and Every Bit of Difference. Seattle: University of Washington Press, 1988. Orloff, Alexander. Carnival: Myth and Cult. Wörgl, Austria: Per-linger, 1981. Poppi, Cesare. "Carnival." In The Dictionary of Art. Edited by Jane Turner. Vol. 5. London: Macmillan Publishers, 1996. Teissl, Helmut. Carnival in Rio. New York: Abbeville Press Publishers, 2000. Turner, Victor, ed. Celebration: Studies in Festivity and Ritual. Washington, D.C.: Smithsonian Institution Press, 1982.